Chop up 1 peach, 1 plum, and 1 cup of cherries. You should have a little over two cups of fruit from it. Add fruit to a small pot with sugar, water, lemon juice, and a very small pinch of salt. Bring to a simmer and let simmer on low heat for 5 minutes. Remove from heat and let cool. Then pulse in a blender. Add thin slices of peaches, plums, and quartered cherries to popsicle molds. Pour fruit liquid over whole fruit. Use a skewer to make sure there are no air bubbles in the molds. 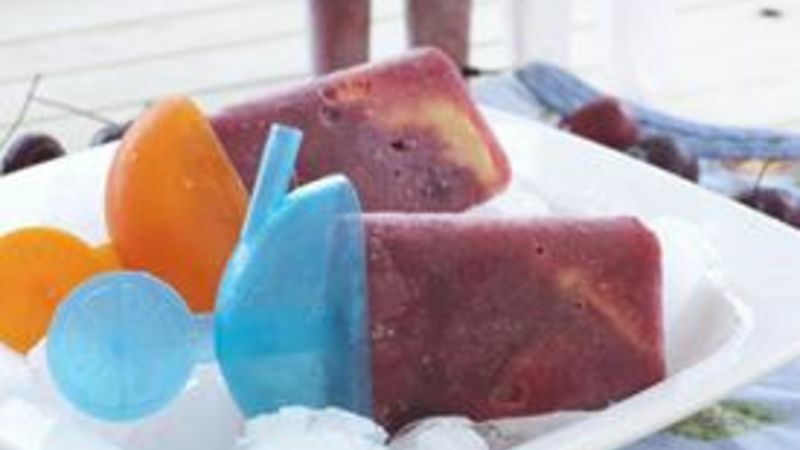 For help removing the paletas from the mold, run them under warm water for a few seconds! These might look like normal ice pops to you, but there’s a world of difference between normal freezer pops and paletas. Technically, paleta is just the Spanish word for frozen treat, and they do look very similar to many frozen pop brands. The difference is many American ice pops are mainly water-based and have a pretty high sugar content. Basically, they’re frozen flavored water. Meanwhile, paletas tend to be way more substantial and have lots of fresh fruit and just a touch of sugar for sweetness. Because there is so much delicious stone fruit that’s ripe and ready to eat this time of year, my stone fruit paletas are the perfect way to store some fruit for later and also beat the summer heat! Of course, to start these guys, you’ll need some stone fruit. I used a mixture of peaches, plums, and cherries for mine, but feel free to experiment based on what you can find that is really ripe. You want about two cups of fruit, so cut up as much as you need to get to that amount. For me, that was a peach, a plum, and about a cup of cherries. Then just combine those in a pot with some water, sugar, lemon juice, and a very tiny pinch of salt. Put this over medium-low heat and bring it to a simmer. Let it simmer lightly for about five minutes. This should combine the flavors and also it should start to thicken slightly. Once it has simmered for a bit, remove it from the heat and let the mixture cool. Since we are going to be blending it up next, you have to be careful. Blending hot liquid is never a good idea because it could splatter all over and burn you. Once the mixture is reasonably cool, just pour it into a blender (or food processor) and pulse it a few times. You can use any frozen molds that you have. The molds I use have a cool straw in the base so you can drink up the liquid that melts as you eat them. It’s possible they’re made for children, but I still love them! I recommend slicing up some more fruit and adding it straight to your molds before pouring in the liquid. It just gives the final paletas some texture. Then pour your blended liquid over the whole fruit pieces. Use a skewer to poke around in the molds and make sure there are no bubbles. Freeze these guys solid and you are done! To remove them from the molds it sometimes helps to run them under warm water for a few seconds. These are completely refreshing and are mostly fresh fruit. If you can get your hands on some ripe stone fruit this month, give these guys a shot! Nick believes that paletas should be given out instead of after dinner mints. Be sure to check out his blog, Macheesmo, his book, Cornerstone Cooking, and check out his Tablespoon profile.